Radiological risk parameters associated with aircrew members traveling from Houston Intercontinental Airport to Lagos International Airport have been computed using computer software called EPCARD (version 3.2). The mean annual effective dose of radiation was computed to be 2.94 mSv/year. This result is above the standard permissible limit of 1 mSv/year set for the public and pregnant aircrew members but below the limit set for occupationally exposed workers. The Risk of cancer mortality and excess career time cancer risk computed ranged from 3.5 × 10−5 to 24.5 × 10−5 (with average of 14.7 × 10−5 ) and 7 × 10−4 to 49 × 10−4 (with average of 29.4 × 10−4 ). Passengers and aircrew members should be aware of the extra cosmic radiation doses taken in during flights. All aircraft operators should monitor radiation doses incurred during aviation trips. The earth's atmosphere is continuously bombarded by radiation from varying sources. They include by-products of cosmic rays from the sun (solar cosmic radiation) and charged particles that originate outside the solar system (galactic cosmic radiation). Cosmic radiation reaching the earth's atmosphere is affected basically by four phenomena namely; the solar cycle, earth's atmosphere, earth's magnetosphere, and altitude. The magnitude of cosmic radiation getting to the earth partly and grossly depends on the sun's activity at a particular period. Occasionally, the sun releases spontaneous outburst of electromagnetic radiation in the forms of gamma rays, X-rays and radio waves. This phenomenon gets to its maximum every 11 years (solar cycle) and during this period, the earth yields to additional radiation intake. Impressively, the intensity of cosmic radiation reaching the earth is influenced by the earth's atmosphere as well as its magnetosphere. According to Bagshaw,  the atmosphere absorbs most of the particles associated with cosmic rays. Furthermore, the magnetosphere deflects partly the cosmic radiation that would have reached the earth's surface. Deflections are maximum at the equator and minimum at the poles where the cosmic radiation penetration depth is maximum. The National Council on Radiation Protection and Measurements recommends a permissible dose limit of 0.5 mSv per month whereas, ICRP recommends radiation permissible limit of 1 mSv per annum during pregnancy. Only flight crews flying both a large number of hours during pregnancy (for example, 100 h in a month) and strictly the highest dose-rate routes (typically global routes such as the United States to Buenos Aires or the United States to Tokyo) would exceed these guidelines. By law, an airline pilot may not fly more than 85 h a month or 1000 h a year. However, the average pilot works more than 100 h a month counting ground duties such as filing flight plans, working on reports, briefing crews and attending training classes. Flight durations of this range per annum for aircrew members may result to an elevated level of effective radiation doses. Radiological risk assessment is an estimate of the probability of a fatal cancer risk as a result of exposure to low-level doses of radiation. It is, therefore, important to carry out frequent radiological assessment of aircrew members to avert unnecessary exposure to cosmic radiation at aviation altitudes. This study was carried out on an aviation trip from Houston Intercontinental Airport, Houston, United States of America to Lagos International Airport, Lagos, Nigeria on a United Airlines flight in 2013. 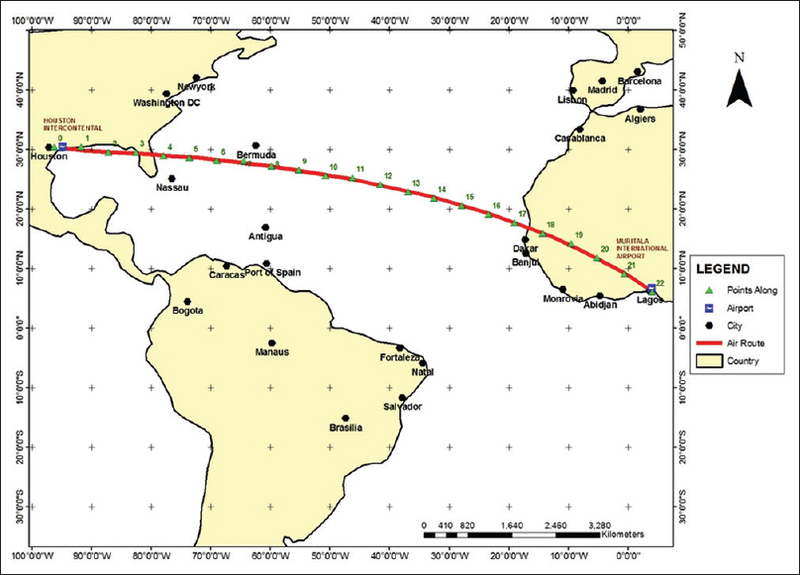 The air route map showing the flight route from Houston Intercontinental Airport to Lagos International Airport is presented in [Figure 1]. 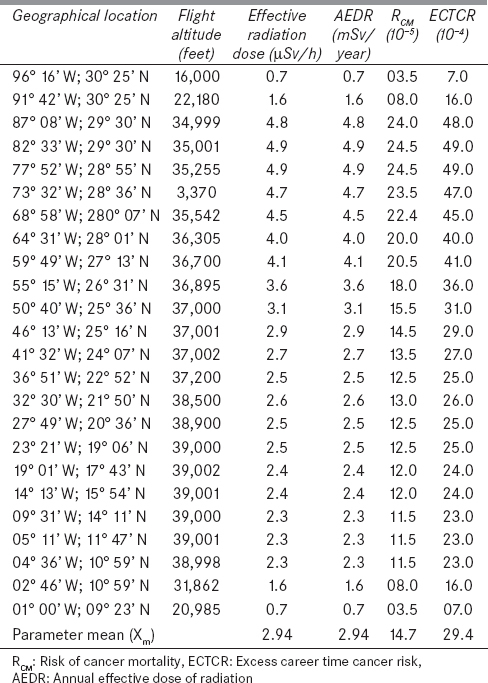 The data collected were the flight geographical locations and altitudes at strategic locations [Table 1]. The effective radiation dose rates (ED h ) at strategic locations (effective dose per hour-ED h ) were computed using a computer software program called EPCARD-version 3.2 (European Package for Calculation of Aviation Route Doses, German Research Center for Environmental health). This computer software is certified by the European Commission for computation of cosmic radiation exposure of aircrew members and passengers. 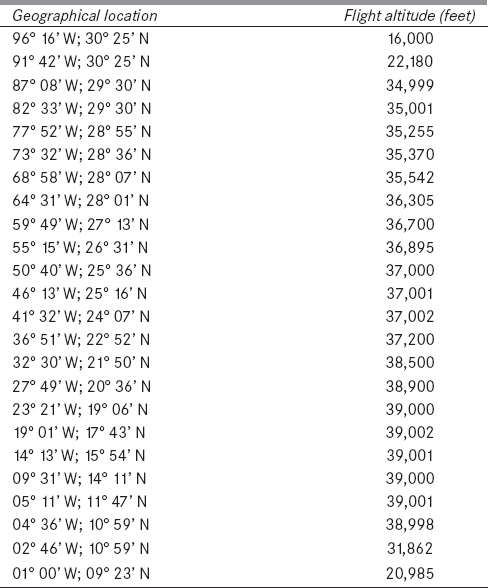 In other to run this software program, the following parameters were keyed in; date of the trip, geographical locations of selected points and flight altitudes. These three parameters took care of the dependence of cosmic radiation exposure on solar cycle, geographical latitude, and altitude, respectively. where K = 1000 is a constant representing the mean number of block hours a typical pilot or aircrew member flies in a year. where RF given as 5 × 10−2 per Sievert (or 5 × 10−5 per mSv) is the "Dose to risk conversion factor for cancer mortality." where n = 24 number of measurement points considered. The results of the ED h , AEDR, R CM , and ECTCR have been presented in [Table 2]. The results show that during this aviation trip which lasted for approximately 14 h, the computed ED h ranged from 0.7 to 4.9 μSv/h (with a mean of 2.9 μSv/h) and 9.8-68.6 μSv/14 h (with a mean of 41.16 μSv/14 h). This amounted to an AEDR of between 0.7 and 4.9 mSv/year, with an average of 2.94 mSv/year. This average result is above the standard permissible limit of 1 mSv/year set for the public and pregnant aircrew members but below the limit of 20 mSv/year set for occupationally exposed workers by International Commission on Radiological Protection, Federal Aviation Administration and Council of the European Union. Recall that since pilots and other aircrew members are classified as radiation workers, pilots, and aircrew members who fly the surveyed routes at similar altitudes are likely not to receive dosages beyond recommended limit. The magnitude of radiation dose received by pilots and aircrew members can be appreciated more if we note that for comparison sake, a single chest X-ray provides roughly 0.02 mSv  and the average annual human exposure on earth due to natural background radiation is 2.4 mSv (1.26 mSv due to air inhalation, 0.29 mSv due to food and body contents, 0.4 mSv due to terrestrial radiation and 0.39 mSv due to cosmic radiation reaching the earth). Management and staff of airline operators are obliged to ensure that the principle of ALARA is upheld so that exposure of workers to cosmic radiation could be kept "As Low As Reasonably Achievable" to minimize the effects of ionizing radiation. The results of the computed radiological risk parameters have been presented in this work. These results are above the standard permissible limits set for the public and pregnant women who are aircrew members but below the limit set for occupationally exposed persons. Long-term continuous exposure to cosmic radiation at aviation route between the Houston Intercontinental Airport and Lagos International Airport is likely to increase the overall risk. Bagshaw M. Cosmic Radiation in Commercial Aviation, Positon Paper-2014, Centre of Human and Aerospace Physiological Sciences, King′s College London; 2014. Available from: http://www.iaasm.org/documents/IAASMPosPaperCosRad2014.pdf. [Last retrieved on 2016 Jan 10]. EPA (United States Environmental Protection Agency). Air Travel and Cosmic Radiation. Johnstown Castle Estate Wexford, Y35 W821; 2015. Available from: http://www.epa.ie. [Last retrieved on 2016 Jan 09]. Campbell RD, Bagshaw M. Human Performance and Limitations in Aviation. 3 rd ed. Oxford: BSP; 2003. Lim MK. Cosmic rays: Are air crew at risk? Occup Environ Med 2002;59:428-32. ICRP Publication 103, the 2007 Recommendations of the International Commission on Radiological Protection. Available from: http://www.icrp.org/docs/ICRP_Publication_103-Annals_of_the_ICRP_37(2-4)-Free_extract.pdf. [Last retrieved on 2016 Apr 26]. Institute of Radiation Protection German. Research Center for Environmental Health. Institute of Radiation Protection; Neuherberg; Germany: 2016. Available from: http://www.helmhotz-muenchen. [Last accessed on 2016 Apr 15]. Hughes JS, Watson SJ, Jones AL, Oatway WB. Review of the radiation exposure of the UK population. J Radiol Prot 2005;25:493-6. Lee J, Nam U, Pyo J, Kim S, Kwon Y, Kim M, et al. Short-term variation of cosmic radiation measured by aircraft under constant flight conditions. Space Weather 2015;13:797-806. Waters M, Bloom TF, Grajewski B. The NIOSH/FAA working women′s health study: Evaluation of the cosmic-radiation exposures of flight attendants. Federal Aviation Administration. Health Phys 2000;79:553-9. Avjobs, Inc., Airline Captain Career Overview; 2016. Available from: http://www.avjobs.com/index.asp. [Last retrieved on 2016 Jan 18]. European Commission, 2004. Cosmic Radiation Exposure of Aircrew, Compilation of Measured and Collected Data; 2004. Smith KP. 2011. Overview of Radiological Dose and Risk Assessment. IAEA Training Course on Nuclear Facility Decommissioning and Environmental Remediation Skills, Environmental Science Division Argonne National Laboratory Argonne, Illinois; 4-15 April, 2011. National Business Aviation Association, 2016. Mandatory Age Retirement for Pilots. Washington DC; 2016. Available from: http://www.nbaa.org. [Last retrieved on 2016 Apr 24]. Malmquist S. Available from: http://www.jetcareers.com [Last retrieved on 2016 Apr 15]. Australian Radiation Protection and Nuclear Safety Agency, 2015. Flying and Health - Cosmic Radiation Exposure for Casual Flyers and Aircrew; 2015. Available from: http://www.arpansa.gov.au. [Last retrieved on 2016 Jan 05]. UNSCEAR, 2008. Report of the United Nations Scientific Committee on the Effects of Atomic Radiation, General Assembly Official Records Sixty-Third Session Supplement No. 46; 2008. Available from: https://www.iaea.org. [Last retrieved on 2016 May 25]. Shantha E, Lewis C, Nghiem P. Why do airline pilots and flight crews have an increased incidence of melanoma? JAMA Oncol 2015;1:829-30. Preston RJ. 2011. Radiation Effects, ICRP Symposium on the International System of Radiological Protection October 24-26, 2011 - Bethesda, MD, USA; 2011. Available from: http://www.icrp.org/docs/Julian. [Last retrieved on 2016 Apr 15].